Tom King and Mitch Gerads’ MISTER MIRACLE have taken the world by storm. 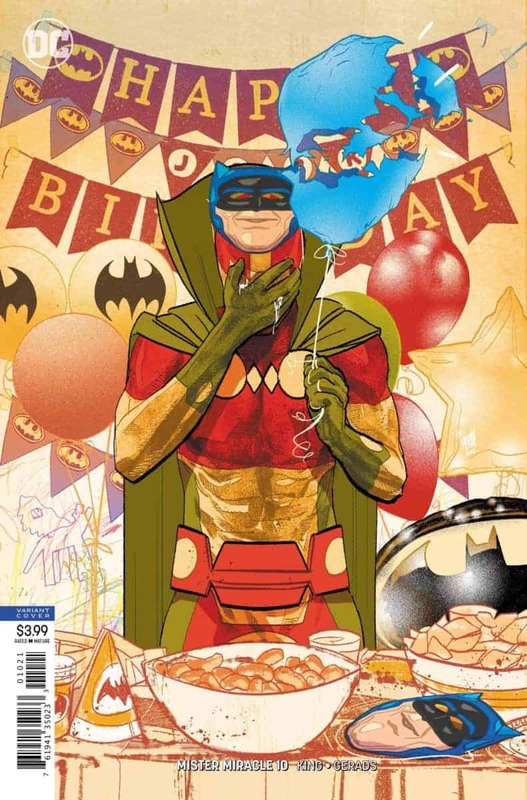 The controversy surrounding whether Scott Free, also known as Mister Miracle, is alive or dead contributes to its popularity. But this is not the comic’s only cause for its widespread acclaim. From the first page of the comic, the reader follows Scott through his crippling depression. In contrast to Scott’s despair, his alter ego of Mister Miracle denies his despondency through his publicized smile. 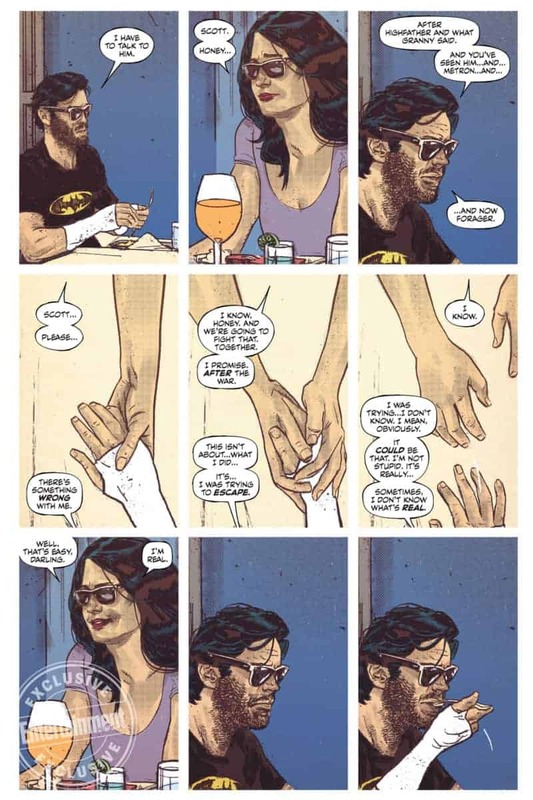 While the theme of depression in MISTER MIRACLE portrays the severe consequences of despair, it also argues that there is an escape from it. For those of you who have yet to read MISTER MIRACLE, please know that there are spoilers ahead, so go and read this comic book first. 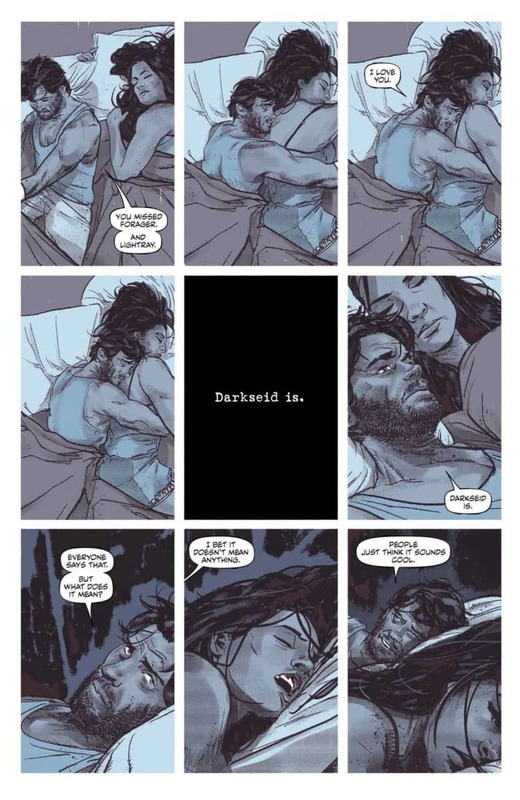 From the first page, Scott Free’s depression in MISTER MIRACLE is blatant. Due to his despair, he can no longer discern what is real and what is not. His reality blends with delusion, even to the point of hallucination. The obscure line between delusion and reality argues the severity of Scott’s depression. Despite these drastic symptoms, he does not know if he is depressed. He tells his wife, Big Barda, that “there’s something wrong,” but he doesn’t know what it is. 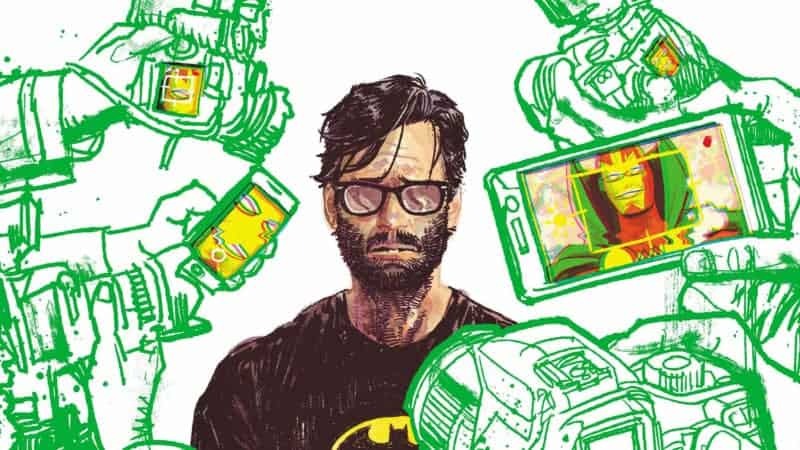 Scott’s confusion surrounding his crippled mentality only strengthens the accuracy of depression in MISTER MIRACLE. When you experience depression, there is no messenger that comes to notify you of your depression and there is definitely no handbook showing you how to escape. You are on your own to discern your emotions and mentality. As somebody who has battled depression, I know how difficult that can be. I battled depression throughout my Sophomore and Junior years of college. The combination of quitting the sport I played for most of my life and losing a couple of family members to cancer dragged me into despair. For a while, I wasn’t sure that anything was even wrong with me. I thought that I was just in a weird and melancholy mood that hit me whenever I was alone. I wasn’t aware that my mentality changed until my girlfriend asked if I was okay. Even after I knew something was wrong, it took some time to discern what was happening. While I never lost sight of reality, I sometimes wondered if I was stuck in a nightmare. Despite accepting my depression, I continued to hide it from the world. Throughout MISTER MIRACLE, Scott Free’s melancholy contradicts the smiling face we see on Mister Miracle’s mask. 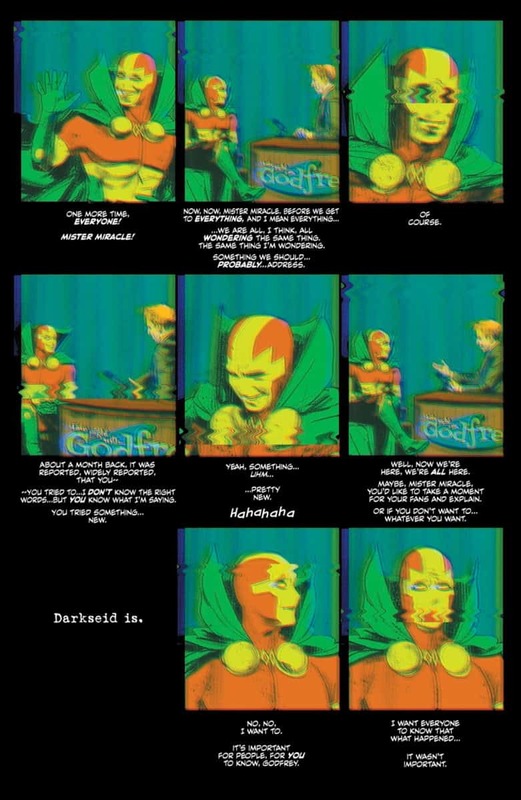 To the public, Mister Miracle is a prime example of mental health. However, that mask simply hides the underlying depression. King and Gerads utilize this contradiction to represent the veil of social media. The world today is consumed by social media. Wherever we go, whomever we see, however, we do it is publicized through Instagram or Facebook. But do our social media profiles accurately convey our true mentalities? Much like Scott does with Mister Miracle, we use social media as a mask. 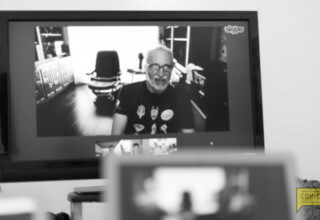 For the most part, our social profiles will maintain happy portrayals of our lives, despite what we might be going through at the time. I am just as guilty of wearing a mask as everybody else. When I battled depression, my Instagram showed a happy college teen who loved his life, but that was the complete opposite of my mentality. I know other people who have been guilty of this as well. Despite losing a loved one, experiencing heartbreak, or going through another emotional trauma, our social media accounts mask this despair. For the most part, our public personas hide our depression from the world. This creates a taboo around depression since we perceive everybody around us as happy. 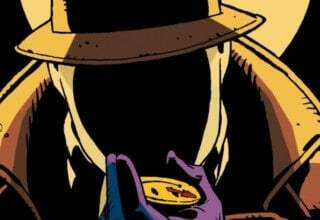 The truth is, we never know what other people are hiding under their masks. In any comic about Mister Miracle, the constant theme is escape. King and Gerads elevate this theme through the challenge of escaping depression. While on the surface, the comic debates the ability to escape death, the true trap is not death, but depression. Although Mister Miracle declared that his suicide attempt was a challenge to escape death, this statement masks the truth. From the first page of the comic book, Scott is attempting to escape depression. His first attempt was through his own death. His failed suicide attempt leaves him hopelessly lost in his despair. He continues to try to escape depression, but soon realizes that he cannot do it alone. King and Gerads utilize Scott’s hopeless evasion of depression to suggest that he cannot escape this trap without help. Throughout the comic, we see multiple instances where Scott states, “I can escape anything,” to which his wife, Barda, responds, “Can you?” Scott’s use of “I” suggests that he must escape his current trap on his own. Contrary to his selfish viewpoint, Barda shows us that he is not in it alone. When supporting Scott through his depression, she uses “we,” suggesting that this is a trap they have to escape together. As the comic nears its conclusion, the love and support of his family suggests Scott Free’s soon-to-be victory in his battle with depression. While the story never explicitly states that Scott has escaped, it argues that his only means of liberation is through love. 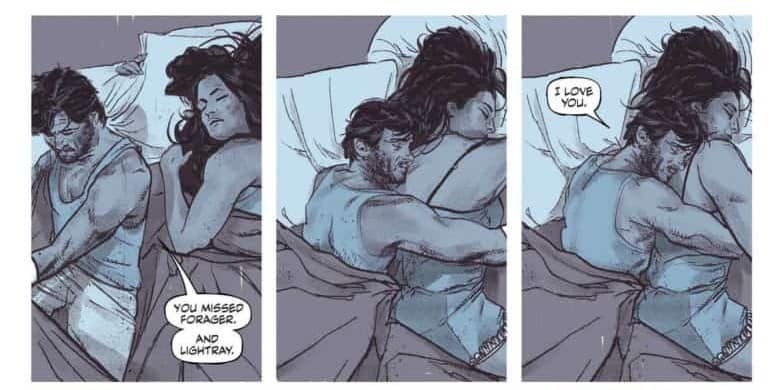 Despite the many questions that MISTER MIRACLE proposes, it argues that the only real escape from depression is love. As somebody who has battled depression, I can attest to this truth. While I was depressed, I found no escape through medication nor through pretending I was okay. Despite my Instagram exemplifying a man in prime mental health, I was deep in despair. Thankfully for me, the love of my life helped me escape before I sank into the abyss of my despondency. Without her, who knows when I would have found my way out. Furthermore, in battling my depression alongside her, I discovered that my despair not only impacted my life, but hers as well. Depression is not a solitary battle, although it may feel like one. Similar to my situation, Scott Free was lucky enough to find a means of escape through Barda. 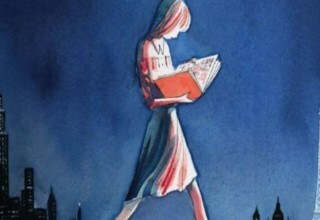 Without her, he might have bled out on the first page or hopelessly lost himself in depression. But he didn’t bleed out and he was not hopelessly lost; he found his way out through his love with Barda. 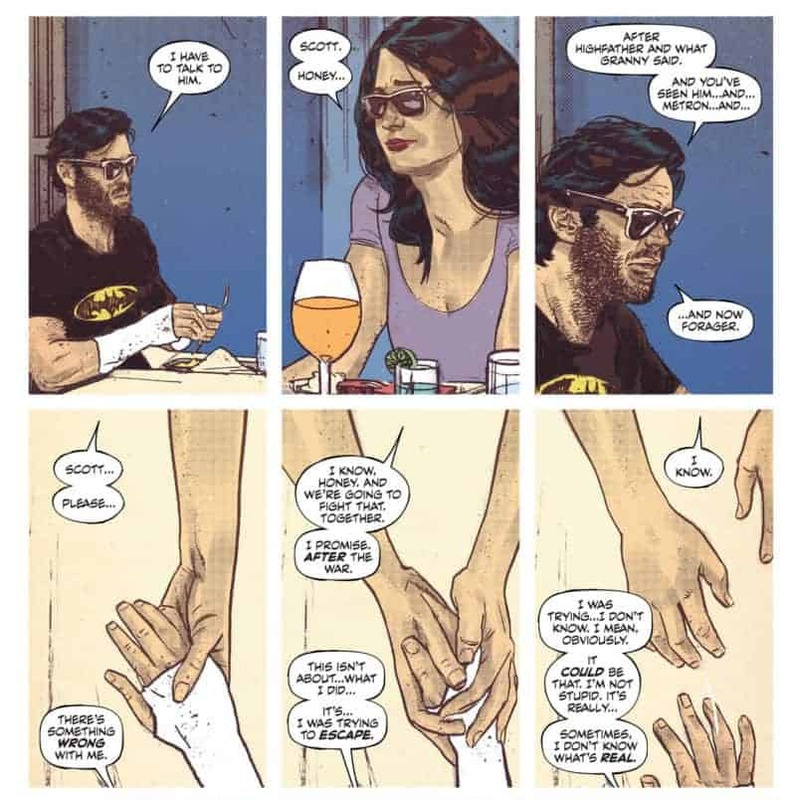 While there is an ongoing debate over whether Scott will survive the first page of MISTER MIRACLE, King and Gerads makes it clear that death is not the way out of depression. If Scott is truly dead throughout the comic and the story is all an illusion in his afterlife, did he really escape depression? His depression is consistent until the end of the comic, and even then, he does not clearly escape. This further argues that the only escape from depression is love and not death. The topic of depression in MISTER MIRACLE argues that anybody who experience depression can escape, not just Mister Miracle. If you are depressed, don’t continue to pretend that you are not through the veil of social media. Let those you love into your life, open up to them and tell them the true state of your mentality. If you are still struggling to escape, then seek professional help. Regardless, know that there IS a way out and that you ARE NOT alone. But keep in mind, there is no quick escape, especially not through death. If you are battling depression and you need help, we have provided a few sources to help you find your own way out. I am sorry that you’re going through something so difficult, but you will get through this. Keep fighting. 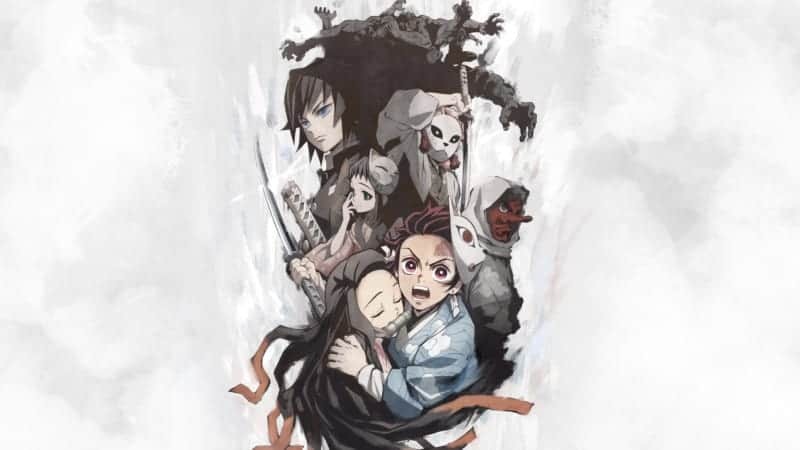 Previous article Does DEMON SLAYER: KIMETSU NO YAIBA Live Up To The Hype?